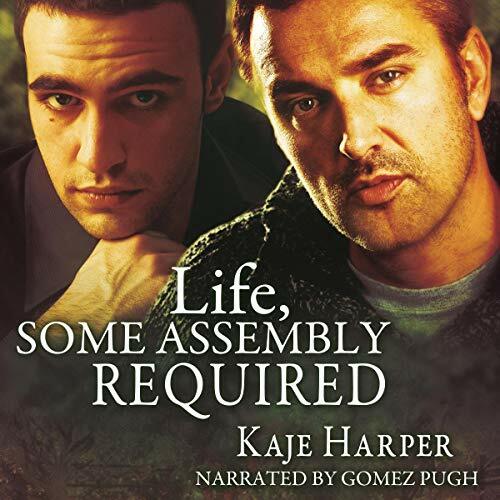 Erryn reviews Life, Some Assembly Required (The Rebuilding Year Book 2) by Kaje Harper (Published June 26, 2017, 314 pages). The audiobook was released January 2, 2019. It is narrated by Gomez Pugh and runs 12 hrs and 2 mins. A copy was provided in exchange for an honest review. Why I read this book: I adore Kaje Harper and loved book one in the series. Finding love in the ashes was easy. Building a life together? Not so much. After spending the first part of his life chasing pretty girls, love has finally come to Ryan in the form of John, a tall, lanky, red-headed landscape architect with wide shoulders and a five-o’clock shadow. For the first time in Ryan’s life, love feels easy. Hell, he even ran into a burning building for John and his son, and he’d do it again if he had to. But telling his father and brothers and classmates “I’m gay. I’ve met a man”? That’s going to take nerve of a different kind. For John, loving Ryan is as natural as breathing. Now if only the rest of his life would fall into place. Dealing with his teen son is complicated enough, but with his ex-wife causing trouble and his daughter wanting to move in, John’s house – and his relationship with Ryan – threaten to split at the seams. Is one month without a new surprise knocking him upside the heart really too much to ask? Unfortunately, the answer seems to be yes. I did two things to prepare for writing this review: I listened to the book and I reread my review for the first book (that I loved). Even now, more than a year later, that review reminds me why I fell in love with John and Ryan. My one complaint about the book was there was a weird subplot that I didn’t feel was necessary. The ending just felt a little over-dramatic. Now, having listened to book 2, it all makes sense. That crisis and the resulting heroism by Ryan along with the helplessness of John are the beginning of this book. It leaves off literally where the first book ended and I was brought right back into that world seamlessly, despite the more than year-long gap. I was able to get into each man’s head as they relived the horror in the form of PTSD and was especially concerned for John’s son Mark who was also involved. All three struggle with the aftermath and in their shared experience, they develop a greater appreciation of the others. Men are often known for holding in their feelings so it’s all the more powerful when they do admit, each in turn, that they’re having problems coping. In the previous book, John’s son Mark had decided he’d had enough of his mother and had come to live with his father. This plotline will hit home for many people as families are often torn apart by divorce. Since I only see Cynthia (John’s ex-wife) through the lens of her ex-husband (John) and her ex-husband’s new lover (Ryan), I wondered about her story and if she was really as vapid and mercenary as she seemed. This book really solidified part of that impression but, near the end, I was able to witness a very different side to her. I was almost – almost – empathetic toward her and her situation. Her stepping back into John and Mark’s lives though, was not without significant upheaval. Hence the ‘some assembly required’. The other subplot is Ryan and his family. He’s always been straight and had never contemplated a relationship with a man. Falling in love was never part of the plan but now he can’t imagine his life any other way. Being one of four boys though with a tough-as-nails father doesn’t give him a lot of hope for acceptance. To say the road is rocky is an understatement, but his love and devotion to John never falters. His adoration and protectiveness of John’s children is never in question. I love the constant theme of family through the book. John’s children have different roles in the men’s lives. Mark lives with them, making his way with music, making new friends and adapting to life. Tori is stuck in Los Angeles with a mother who has other concerns and a step-father who is downright cruel. That she hides her true self is a given. That she finds the strength to eventually be honest is a testament for her love and faith in her father and Ryan. In the end, the family is a solid unit. They find a way to make life work and when the men commit to each other, I had no doubt this was a permanent thing. I couldn’t wait for the next book and since it was released at the same time, I jumped on it as well, doing a binge listen. I cannot say enough good things about Gomez Pugh. His John is perfect with the confident timbre and the calming tone. Ryan is a bit more excitable, which fits. Gomez’s Cynthia is still a bit shrill, but that fits her personality. He provides great voices for the kids, including 12-year-old Tori. I love when one narrator does all the books in a series and he is perfect for the role. Another hit with Kaje Harper and Gomez Pugh. You must be 18 years or older to participate in this giveaway. Void where prohibited. Etc. This giveaway ends on March 8, 2019 at 11:59 PM CST. GOOD LUCK! I get asked about my name a lot. It’s not something exotic, though. “Kaje” is pronounced just like “cage” – it’s an old nickname. I was born in Montreal but have lived for 30 years in Minnesota, where the two seasons are Snow-removal and Road-repair, where the mosquito is the state bird, and where winter can be breathtakingly beautiful. Minnesota’s a kind, quiet (if sometimes chilly) place and it’s home. My husband finally convinced me that after all the years of writing for fun, I really should submit something, somewhere. My first professionally published book, Life Lessons, came out from MLR Press in May 2011. I have a weakness for closeted cops with honest hearts, and teachers who speak their minds, and I had fun writing four novels and three freebie short stories in that series. I was delighted and encouraged by the reception Mac and Tony received. I now have a good-sized backlist in ebooks and print, both free and professionally published. A complete list with links can be found on my website “Books” page at https://kajeharper.wordpress.com/books/. You can find me and my book reviews on my author page here on Goodreads – I hang out on Goodreads a lot because I moderate the Goodreads YA LGBT Books group. I also post free short YA stories on that group, more than 50 of them so far. I loved this audio – I love this series. It’s so genuine and real. Pugh really does an awesome job narrating it. this sound wonderful. thanks for the chance. I love these two guys and their sensitive handling of the family issues that develop when relationships change. This is a fantastic series and I enjoyed reading your review.